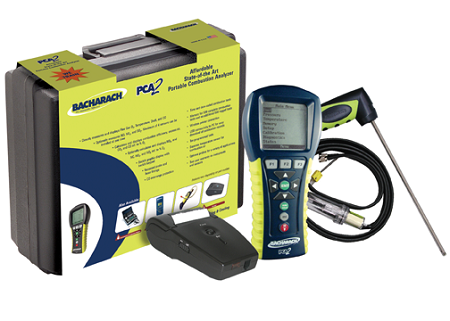 Bacharach 24-8447 PCA 3 225 Combustion Analyzer Kit with O2, CO/H2-compensated measurement and printer is the first advanced portable combustion analyzer with full color graphic display, giving the PCA 3 superior visibility and user friendly interface. The Bacharch 24-8447 PCA 3 measures and displays flue gas oxygen, carbon monoxide, stack temperature, combustion air temperature, draft and differential pressure. 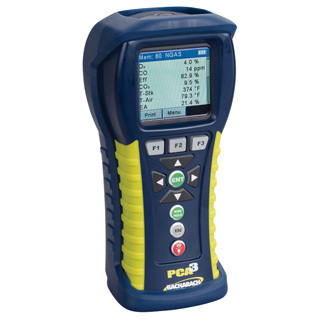 The PCA 3 is an essential tool for industry professionals who need to ensure operating conditions, determining combustion efficiency and performing emissions tests. The kit comes complete with a printer, hard carry case, 12" probe and hose assembly, factory calibrated and installed sensors, protective boot with magnet, 3 pack of replacement filter element, instruction manual, 4 AA batteries, USB cable, Fyrite User software and a 2-year warranty.